What's the Difference Between Working, Medium, Extended, and Collected Trot? Dressage Tests require the rider to ride each one of these trots. But most riders don't really know how they differ from each other. So they unnecessarily lose points. You're getting ready to practice your dressage test. How hard could it be? A little trot, a little canter, a few circles. But then you notice terms like "working trot", "medium trot", "extended trot" and "collected trot". You're pretty sure you know the difference between extended and collected trot. But what's the difference between working and medium trot? If you're confused, rest assured, you're not alone. Many dressage riders are unsure about what these terms mean. As they say, one picture is worth a thousand words, so take a look at the illustration to the left. diagonal legs separated by a period of suspension. the extended trot. The steps should be regular and the horse should remain balanced. the hindquarters. In the forward movement of the extension, the movement of the fore and hind legs should be similar (parallel). Collected Trot: The collected trot is shorter than the working trot, but with increased lightness and mobility of the shoulders. The hocks should be well engaged, the croup lowered, and the horse should remain on the bit. Video clips are even better than pictures, so here are some very short ones that demonstrate each of these trots. The difference between working and medium trot. The horse is in working trot at first, and changes to medium trot as they cross the diagonal. 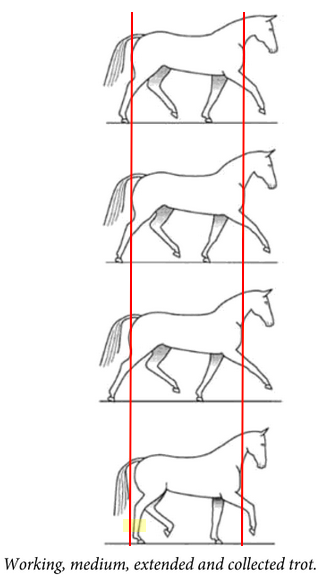 Notice how the gait lengthens in medium trot, but the tempo remains the same. ​The difference between medium and extended trot. Notice how the legs stretch further and the body elongates, yet the tempo does not change. The difference between extended and collected trot. Notice again how the tempo does not change, but the ground covered in each step differs dramatically. Also notice in collection how the horse's back is higher, his core muscles are engaged, and his hind legs are stepping well under his belly. The horse should maintain a steady tempo, regardless of the type of trot. In medium trot, the horse reaches and rounds through his back more than in working trot. In medium and extend trot, the horse lengthens his stride so he covers more ground with each step. But the tempo remains the same. He does not get faster. When he collects, he covers less ground with each step. Collection has nothing to do with putting the horse's face on the vertical. The horse's back rises under you, his hind feet reach under his belly, his croup lowers, and his entire body becomes shorter from back to front. ​Read more about why experts say you should draw your tests.